WASHINGTON (CNN) -- Eric Holder was sworn in Tuesday as U.S. attorney general, becoming the first African-American to lead the Department of Justice on a permanent basis. 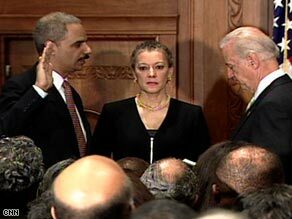 Vice President Joe Biden swears in Eric Holder, left, as attorney general Tuesday at the Justice Department. Vice President Joe Biden administered the oath of office after reading the Justice Department's mission statement. "There's no mention of politics in that statement. There's no mention of ideology," Biden said. "And that's as it should be." "Nowhere but in this great country could a person like me or the president hope to achieve the positions we are now so fortunate to hold," Holder said. By a 75-21 vote, the U.S. Senate on Monday confirmed President Obama's nomination of Holder. Holder, 58, is a former federal prosecutor and served as deputy attorney general during the Clinton administration. He was briefly acting attorney general in early 2001. Holder takes over a Justice Department battered by a series of controversies during the Bush administration, from questions about how it laid legal groundwork for harsh interrogations of suspected terrorists to the firings of top federal prosecutors in several cities. "There's a big job to do, and it's going to be Mr. Holder's duty to turn this department around and restore its credibility," said Sen. Dianne Feinstein, D-California. During confirmation hearings, Republicans questioned his role in former President Bill Clinton's widely criticized last-minute pardon of fugitive financier Marc Rich and questioned whether he would be independent of the White House. Holder had a testy exchange with the Senate Judiciary Committee's ranking Republican, Arlen Specter, who questioned Holder's "fitness" for the office. Holder shot back that Specter was "getting close to the line in questioning my integrity," and Specter ultimately supported the nomination. But Sen. Jim Bunning, R-Kentucky, cited the pardons and what he called Holder's insufficient support for gun rights in opposing the nomination. "Mr. Holder is supportive of old ideas for gun control that have never made people safer at the expense of taking away their rights," Bunning said. All 21 of the "no" votes were Republicans, but more than a dozen GOP senators joined Democrats in confirming Holder. Sen. Christopher "Kit" Bond, R-Missouri, said Holder convinced him he would be "looking forward to keeping the nation safe." Bond, the ranking Republican on the Intelligence Committee, raised concerns that the administration would seek to prosecute U.S. officials involved in using what the Bush administration called "alternative" interrogation techniques, measures that critics said involved the torture of prisoners in U.S. custody. Holder unambiguously called the use of waterboarding against suspected terrorists a form of torture that violated the Geneva Conventions, but he has said that prosecuting intelligence officials who followed Justice Department guidance would be "difficult." Bond said that while Holder's answer focused on U.S. officials who were following the administration's legal advice, "I told him, and I believe he understood, that trying to prosecute these lawyers or political leaders would generate a political firestorm."